How to Validate a Pharmaceutical Process provides a “how to” approach to developing and implementing a sustainable pharmaceutical process validation program. The latest volume in the Expertise in Pharmaceutical Process Technology Series, this book illustrates the methods and reasoning behind processes and protocols. It also addresses practical problems and offers solutions to qualify and validate a pharmaceutical process. Understanding the “why” is critical to a successful and defensible process validation, making this book an essential research companion for all practitioners engaged in pharmaceutical process validation. This book is thoroughly referenced and based on the latest research and literature. 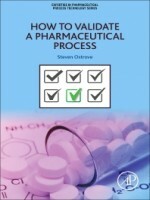 It illustrates the most common issues related to developing and implementing a sustainable process validation program and provides examples on how to be successful along with covering important topics such as the lifecycle approach, quality by design, risk assessment, critical process parameters, US and international regulatory guidelines, and more.